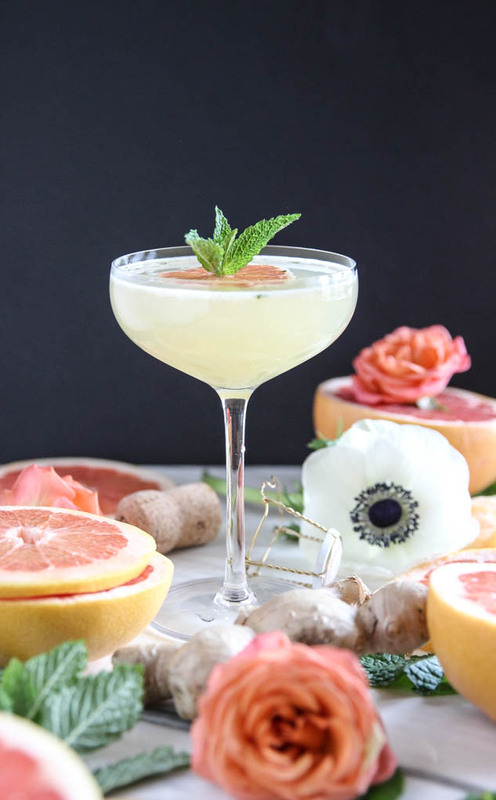 Beautiful mimosa variation to change things up from basic OJ + bubbles! 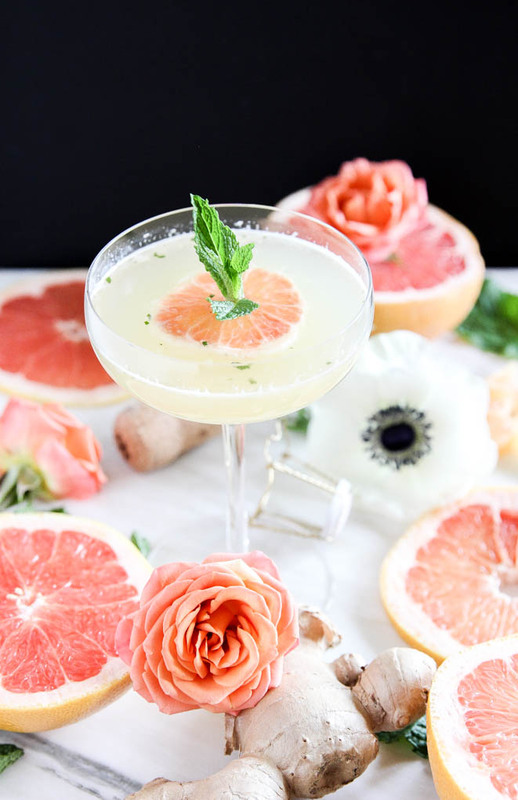 John and I fell in love with grapefruit juice mimosas whiles on our honeymoon in Mexico. I wanted to brighten up the mimosa even more with sweet mint and fresh ginger. With enough experimenting I settled on this recipe that I'm stoked to share with you today. 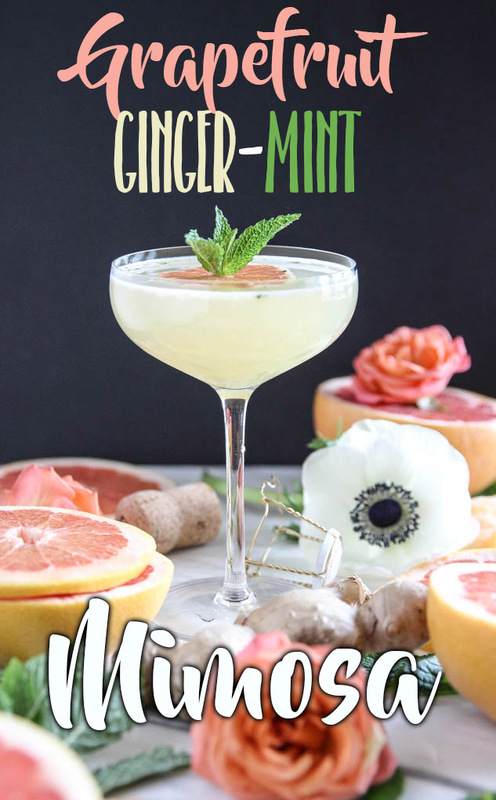 Even better, there's an AMAZING non-alcoholic "mocktail" mimosa version of this recipe that tastes just as satisfying and delicious, sans alcohol. This is great for folks who don't drink, are pregnant, or are cutting back on calories. They still deserve a cheersworthy beverage! Pop a coupe glass, stemless wine glass, or lowball glass in the freezer before preparing the drink. Juice 1/2 of your grapefruit and pour juice into a shaker. Add 3-4 mint leaves and 1 tsp. 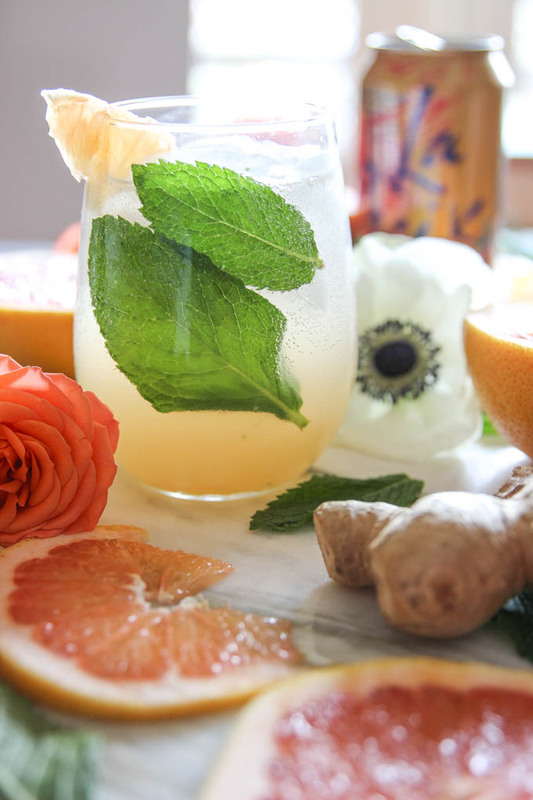 of minced fresh ginger and muddle together for 5-10 seconds (if making non-alcoholic mocktail Spritzer, add 2 tsp. agave and muddle at this time). Then, fill shaker halfway with ice and shake for 10 seconds. 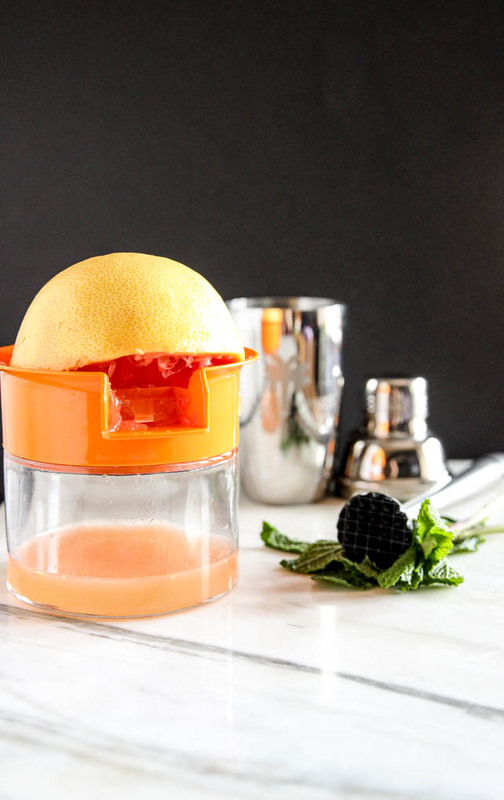 Take out the chilled final serving glass and pour in ginger-mint + grapefruit mixture from the shaker. Pour in 2 oz. of Prosecco OR grapefruit flavored sparkling water. SO EASY, right? This beaut is incredibly simple, but a total crowd pleasure on a warm day. It's a great variation to change up your typical OJ + bubbles mimosa. It takes just a tad more effort than pouring OJ + bubbles in a glass, but trust me it's worth it! What drinks are you all serving on warm/hot weather days that your guests love? I'm always looking for new recipes and ideas. Comment below & let me know! Also, if you make this pretty little thing, post to social media and tag it using #cheersyears - I'd love to SEE. Here's to mimosa variations, because we just can't get enough... Cheers!